The aliens of, err, Alien have been a part of many crossovers, especially in the comics realm. Versus Predator, of course. Versus Batman. The list goes on. But their latest comic book crossover will see them go up against horror heroine Vampirella, and presumably, there will be blood. I’ve loved ‘Alien’ since I first saw it as a kid on a crummy old TV in a well-lit room and got scared half to death anyway. Now that I have the chance to add a little corner to that universe I couldn’t be happier. And pitting such an implacable horror against Vampirella? That’s a meeting that definitely produces very fertile story-telling ground. The ‘Alien’ franchise has always thrived with strong women in the lead. Smart, self-assured Vampirella is a joy to write for, even when she may have met her match. Vampirella going all Ellen Ripley and tearing the Aliens a new one? I don’t have any complaints about the sound of that. 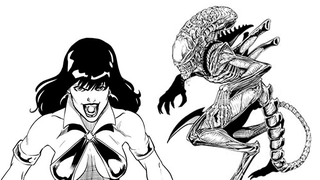 Aliens/Vampirella will debut later this year.